At videopixie we see thousands of video projects every month, covering a wide range of budgets and styles. And naturally we’ve built some heuristics for what makes a good video. But until now we didn’t have any data on how videos actually performed! Do high-end videos help raise more money? Can amateur-ish videos succeed just as well? Do informational videos perform better than ones with emotional appeal? We asked campaigns on Videopixie and outside how much their video helped them raise in the end. I’m going to share some early results based on a small sample size. To receive our final results, you can take our survey if you've launched a campaign before, or email me thomas@videopixie.com if this is your first rodeo. It’d be naive to think that a video alone can make or break the future of a startup. Many other elements are at play, how much advertising went into promoting the campaign, how attractive is the underlying product. So as you review this information please bear the in mind the obvious: video is just one of the many things a startup needs to get right, not the end all be all. However don’t underestimate what a good video can do for you. My friends at [stealth company] made a video of their new cool hardware, it caught fire on Facebook, they got 4M views, and with a tiny bit of advertising, they scored 40k+ signups. Assuming a 10% conversion rate, that’s 4,000 backers already secured! And they haven’t even announced their kickstarter yet. Think of video as a very powerful tool to communicate and reach customers… if you know how to use it. So how to make a successful video for your startup. I thought I’d go over some of the most frequent questions we get asked by our users, and answer them with a mix of early insights from our survey, and other anecdotal evidence. How much should you spend on your video? We get asked this question all the time. From the data collected so far, we see that on average campaigns that raise the most are also those that invest the most in their video. 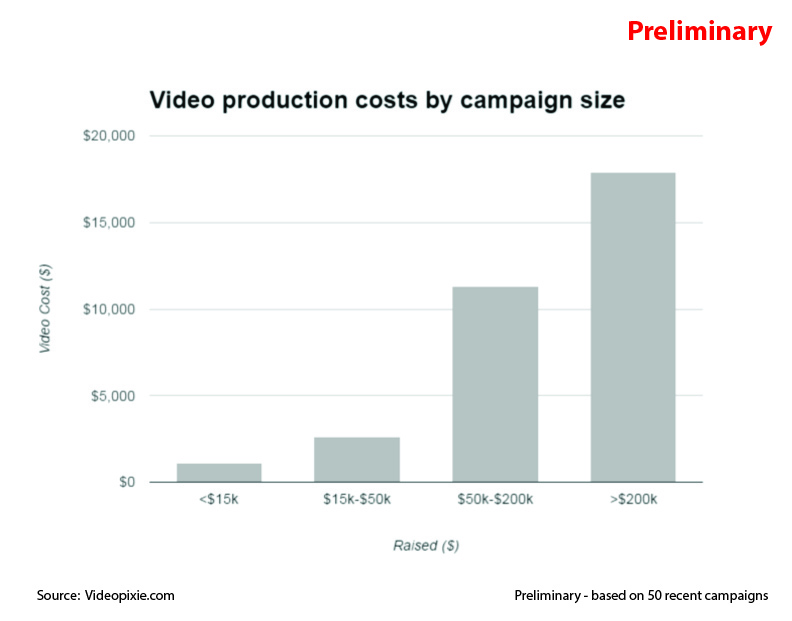 There are exceptions of course, and you’ll find very successful campaigns that spent very little on their video, but on average most campaigns that spent >$15k to make their video ended up raising >$200k. To be honest we were a bit shocked to see how many successful campaigns had professionally made videos. The vast majority. Long gone are the days of amateur pitch videos. Experts in the industry suspect that as startup started to use crowdfunding site to pre-sell items, rather than funding a good cause, that it became more and more important to build trust in the company, and that a polished video help do just that. Product description (30s-1min): describe its features as clearly and succinctly as possible. There is definitely a “Crowdfunding” format, a format that Kickstarter and Indiegogo audiences expect to see. And it doesn’t really pay off to deviate from it especially if you want your campaign to be picked as staff favorite. Of course you have more leeway if you self-host, in which case there are no rules for how to drive traffic to your campaign. Some founder presence is better than none. Good news for founders who are camera shy, or have a thick accent (I am French, I know). Contrary to what we thought going in, founders don't need to front and center throughout the video. In fact it seems like it could hurt, especially if the engagement level isn't quite right. Many videos did very well with just a few seconds of founder talk towards the end. Get some help, especially if this is your first time making a video. We found several successful campaigns that opted to make their video in-house, but every single one of them had prior experience with video production, and it didn't stop them from hiring some outside help for specialized tasks (eg. animations, filming) as required.